We disassemble each stove down to its smallest part and sandblast every piece. Any missing parts are replaced and others are professionally repaired as necessary. All nickle-plated parts are re-plated, (not just buffed and polished). 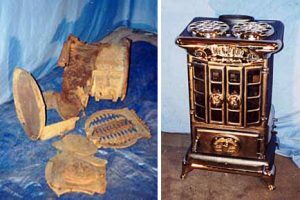 After careful reassemble and fitting, stove paint is applied, followed by stove polished (which gives a rich lustrous glow to your new treasure). We will give you a free estimate on the restoration of any stove that you may own, or use our extensive network to locate a restorable stove that meets your requirements.